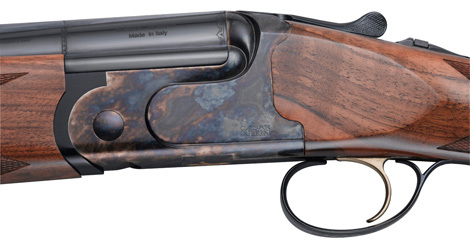 We’re all avid bird hunters at Caesar Guerini, and in developing the Woodlander we wanted a gun that would truly reflect our deep passion for fall coverts, autumn foliage, wet gundogs, and the smell of wood smoke. 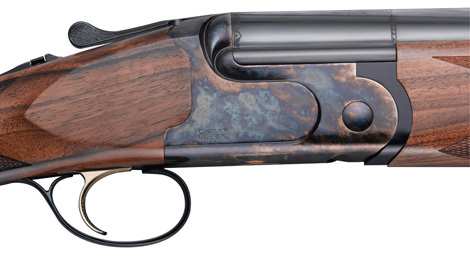 The result is just the shotgun discerning sportsmen would envision in such a setting, with the understated elegance of color case hardening and nicely figured, oil-finished English walnut that speaks of quality from a bygone era. For the hunter whose priorities are traditional good looks in a superior-handling upland game gun that’s perfect for tight cover and fast-flushing birds, the Woodlander is the gun for you. Every Caesar Guerini field gun comes with a velvet lined lockable hard case and five precision patterned flush chokes (CYL, IC, M, IM, F). A plastic choke case is also included. 12 Schnabel Single Selective 28″ 5- C, IC, M, IM, F 3″ 6 lbs. 12oz. 20 Schnabel Single Selective 26″ 5- C, IC, M, IM, F 3″ 6 lbs. 3oz. 20 Schnabel Single Selective 28″ 5- C, IC, M, IM, F 3″ > 6 lbs. 3oz. 20 Schnabel Single Selective 30″ 5- C, IC, M, IM, F 3″ 6 lbs. 3oz. 28 Schnabel Single Selective 26″ 5- C, IC, M, IM, F 2¾” 6 lbs. 2oz. 28 Schnabel Single Selective 28″ 5- C, IC, M, IM, F 2¾” 6 lbs. 2oz. 28 Schnabel Single Selective 30″ 5- C, IC, M, IM, F 2¾” 6 lbs. 2oz. .410 Schnabel Single Selective 28″ 5- C, IC, M, IM, F 3″ 6 lbs.